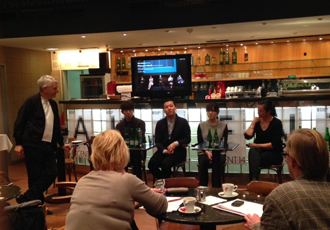 Last November, KAMS’s funding program Center Stage Korea, the Korean Cultural Center in Budapest, Hungary, and the Literature Translation Institute of Korea sponsored an eastern European tour for the theatrical production "Pizzas for the People," a play directed by Kim Hwang. Though the tour was but 20 days, the production’s stops in Cluj-Napoca, Romania; Budapest, Hungary; and Plzeň and Prague, Czech Republic, offered me a fascinating, first-hand look at Eastern Europe’s independent theater circuit. If I am to translate, the FestivalTempsd’Images, which roughly means The Time of Images Festival, was established in 2002 by ARTE, a publicly managed European arts and culture channel jointly established by France and Germany. In addition to its role as a broadcaster, ARTE also serves as a festival network, with events hosted in France, Germany, Romania, Hungary, Portugal, and Canada. Although the annual theme or the characteristics of each nation’s hosting organization may vary from year to year, the festival is not limited to simply applying video and media techniques as an instrument for art. Instead, the festival’s works look to these mediums and integrate their far-reaching influence and effectiveness into performing arts pieces, promoting the festival’s mission of connecting society to art with a less ephemeral lifespan. Cluj-Napoca, where the Romania edition has been held annually since 2008, is an education-driven city where both university students and Hungarian minority make up a large portion of the population. Because of these characteristics, Cluj-Napoca is one of Romania’s epicenters of culture, second only to the capital, Bucharest, and in some ways boasts a more lively community of youthful and experimental ventures. The Festival Temps d’Images in Cluj is a contemporary art festival focused on theater, dance, and video, and is organized by the privately-run ColectivA, a collaboration between contemporary art planning and production groups. This year’s festival was held from November 6 to 16, with the theme “What Feeds Us?” There was a full-scale lineup of pieces that incorporated real food items, highlighting food’s significance to survival, with a slogan that targeted issues embedded in socioeconomic systems. Due to the event’s regional focus and budgetary needs, international programs were mostly showcasing pieces from Eastern Europe—Russia, Ukraine, and Poland, among others—but this year the program expanded into Asia with the unprecedented inclusion of “Pizzas for All.” Besides the performances, the festival also ran simultaneous programs featuring young performance artists and planners from around the world, turning the event into a stronghold in the eastern European network. As would appear fitting in a breeding ground for youthful contemporary art, the programs in the latter part of the festival served as a platform for young domestic artists, focusing on exhibitions and conversations between artists. 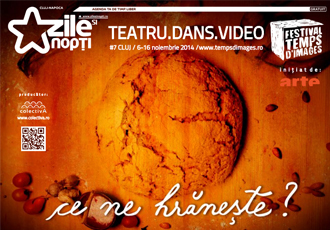 This year’s creative roster in Romania was given the theme “The Past Is Dead?” (Is the Past Dead?). The performance pieces, as well as the platform and talk sessions, questioned the societal chaos and rampant corruption in politics —despite the 1989 dismantling of the authoritarian Communist regime under Nicolae Ceauşescu. 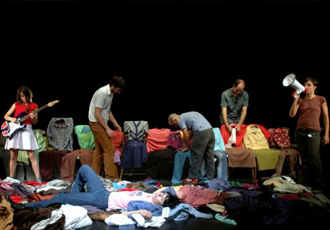 The Czech Republic’s Akcent Festival is a festival that has been hosted by Prague-based contemporary performance art theater Archa Theatre since 2010. “Archa,” a reference to Noah’s Ark, is a name with two meanings: first, “to renovate a building flooded with water,” and second, “to support society with a variety of art.” The Archa Theatre is known for being the first theater in the Czech Republic to appoint its art director through a public job listing, which they did in 1991. Equally notable is that, upon being hired, the new director was given the freedom to steer both the performance program and the entirety of its business management, tasked with upholding the theater’s mission: maintaining the connection between the performing arts and society as a whole. 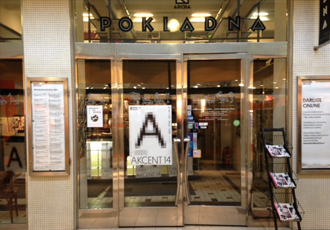 The Akcent Festival is a platform that has introduced a number of distinguished contemporary performance groups from overseas whose works align with the aims and values of this theater, including Germany’s She She Pop, China’s Living Dance Studio, New York’s Palissimo Company, and Belgium’s Het Kim, among others. Now in its fifth year, the Akcent Festival has seen a considerable development in its claim of advocacy for the “documentary theatre festival.” Jana Svobocova, director and festival art director, describes this change as “a natural return for a festival that has consistently explored a connecting role between art and society.” In the case of this year’s festival, there were multiple pieces delving into the theme of “Before the War or After the War?”: The festival lineup included She She Pop’s “The Rite of Spring,” where mothers and daughters came onstage together and reviewed both daily life and history; “My Life After,” directed by Lola Arias, which features non-professional Argentinean actors who, while talking about themselves and their families onstage, have a collective revelation that they are connected as both the perpetrators and victims of the 1976 military coup in Argentina; “Brass Band” by Czech director Jiří Havelka, which recreates the bar scene of a 1945 massacre of Germans in Czech Republic; “Pizzas for All” by Kim Hwang, where a contraband channel in China aims for communication between the youths of North and South Korea. There were also debates, still ongoing, about today’s “wars” and art’s methods of intervention, and a roundtable that asked questions about the relationship between documentary movies/performances and reality. 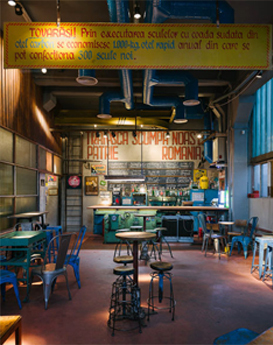 “Pizzas for All” went onstage in Budapest, Hungary, at a multicultural space known as MÜSZI. The name translates as “culture, community floor,” a reference to the space’s history as part of a floundering department store that was rented by an artist and reinvented. It is now run as a “floor of culture/community” and includes shared offices and studios for art groups and civilian organizations, a performance space, an exhibition space, and a café. Because the show runners at MÜSZI have reused existing items and furniture from the space’s time as a department store, there is no consistency in the center’s decor. The result is a space that is open around-the-clock and continually attracts young Hungarian artists and activists always working toward some new venture. 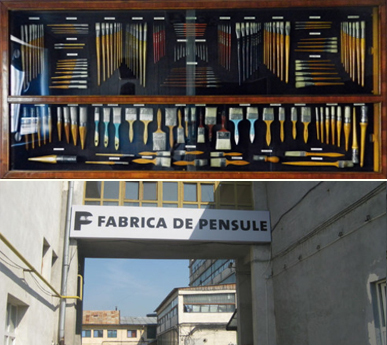 Fabrica de Pensule (“Paintbrush Factory”), both an important space for the Festival Temps d’Images and the home base of festival organizers ColectivA, is a space with a similar background to that of MÜSZI. 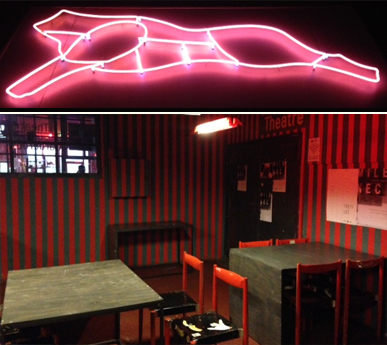 The studio is run by a team of independent artists who sought out a factory space some distance from the city center and remodeled it to include an office for each group, a performance venue, an exhibition space, a shared kitchen and a club. With a strong presence in Cluj, Fabrica de Pensule is, a major contemporary art center that draws in a variety of artists and is a necessary stop for industry professionals visiting from out of town. In Prague, too, there is another space where young artists can come and go as though they were visiting a guest house or salon. 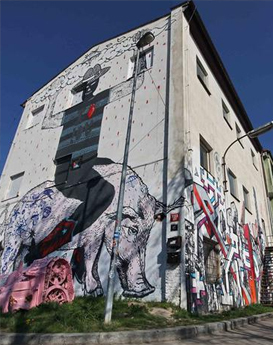 Located near the city’s Praha-Holesovice railway station, close to the tranquil and secluded railway tracks, is the Meet Factory, a structure almost entirely covered in graffiti. As a place that features contemporary multimedia art, including music performances, plays, and visual pieces, it also has shared areas designed to aid impoverished young artists, such as a common room and a bicycle repair center. Although the space itself was the creation of a single artist, it’s run and funded collectively, and as a non-profit multicultural space, Meet Factory also runs residency and education programs. Despite the differing political and economic situations of each country, my overall impression was that, after the disintegration of the Communist regime, the contrast each nation witnessed between the dream of joining the global capitalist economy and the reality they eventually experienced bestowed the eastern European art world with a cool-headed self-awareness—a tension of sorts. Although I spent a mere half-month there, the contemporary art that these young people were creating was sophisticated, sensual, and yet also political; what I saw was less a deliberate attempt to promote experiments in artistic form and aesthetics than it was a scene derived from a sense of mission, one that is still discovering how it might face reality head-on and communicate about the experiences of its citizens. In such a chaotic political and economic situation, these young members of society set up a place where they could meet and prepare to weather the storm by putting their heads together and supporting one another through the struggle. Koh Jooyoung is an independent planner that designs, produces, and coordinates projects for artists in Korea and Japan, and also works as a translator.